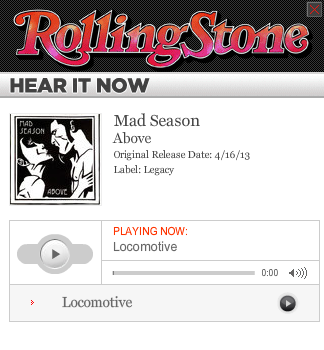 Mad Season’s lone album “Above” came out in 1995. It was created by Layne Staley, Mike McCready, Barrett Martin and John Baker Saunders and remains a favorite of mine since I picked it up on it’s release day. There was some song writing that happened for the planned second album, “Disinformation”, but due to the death/overdose of Saunders in 1999 and then Staley in 2002, the project was shut down and no more work continued. Fast forward to late 2012, when Barrett Martin announced a new Mad Season box set, complete with the original album, 3 new songs from the aborted “Disinformation” sessions with Mark Lanegan on vocals, a newly edited full performance of the band at the Moore Theater that took place on April 29, 1995 and other live bonus footage. While the original band can never be, this is pretty incredible that the project was revived with the new songs and the live performance, which was one of only a few the original band did. If you are a fan of this album, the new remastered set comes out April 2, 2013 and is available via pre-order at Amazon.com. There’s an iTunes pre-order as well, but it does not include video of the Live at the Moore [just the live audio]. The physical version is the desired format for this Mad Season fan. Watch the video below, where they have put together a collage of footage of interviews and live performances, describing the band and how they came to be. Mad Season – Above Deluxe – EPK from Pearl Jam on Vimeo. You are most welcome, sir. A great song, indeed. Maybe it’s just me, but that doesn’t sound like it warrants a box set, per se. The 3 extra songs is one part, but that full concert at The Moore is one of the things I am excited for, enough to pay for this set.